The amp has been designed to fit on a computer desk and the overall footprint allows neat installation. 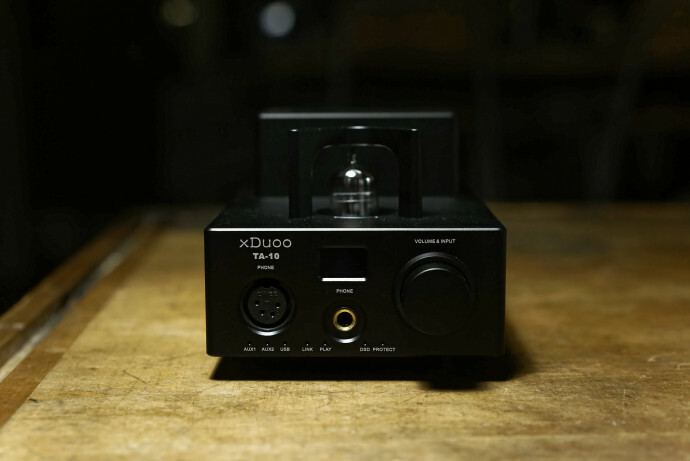 The xDuoo TA-10 is only 23cm long and 12cm large, smaller than an A5 sheet of paper.The vacuum tube, a 12AU7, stands at the front of the amp and can be protected by a small metal cover. This cover is magnetic so you can easily remove or install it, no screwdriver needed. Like most tube amps, the back of the TA-10 is topped by a small protuberance where you can find the capacitors or sometimes a toroidal coil. The blend is perfect and there is absolutely no gap between these two parts. Same can be said for the mode-selection LED, each one is perfectly aligned. Build quality is almost flawless, if not for the volume knob. The case is made of one full block of aluminium and gets the smooth anodized finish. Each input/output is clearly labelled and fits directly in front of its opening, something that bugs me really hard on high-end products. The headphone outputs are sturdy, neatly integrated and should endure the countless plugs/unplugs of your headphones. Last but not least, you have a small two-digit screen that displays your volume level, from 0 to 95. I was not very aware of xDuoo products, but this amp doesn’t fall short compared to higher-priced gear. Sure, it’s a bit light-weight, but once you’ve installed it, you can’t say anything bad about the design. Chinese tube-amplified DACs are nothing new, there are countless of brands out there. 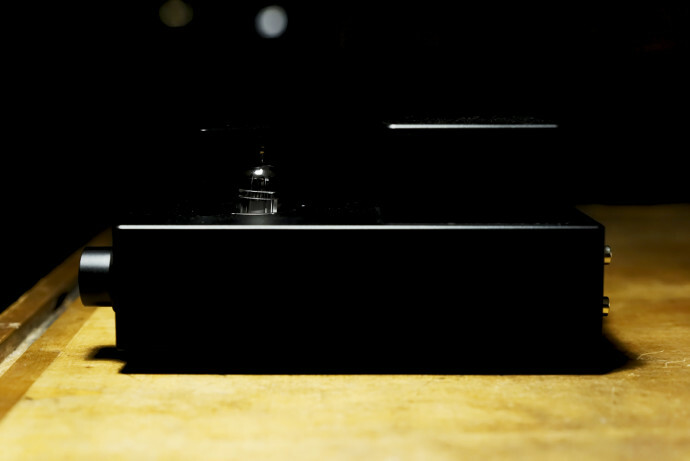 xDuoo is one of the few that made it internationally and got praise by the audiophile community. The Triode Tube chosen for the TA-10 is a classic 12Au7. A commonly found tube with good performances and great sound/quality ratio. Output power is rated at 2000mW @32ohms with both outputs: XLR 4-Pins and Jack 6.35mm. 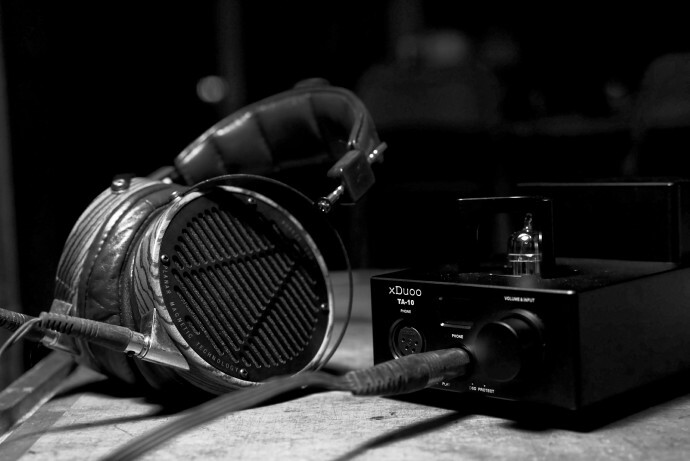 This is enough to drive any can you want, even some Sennheisers or the Audeze stuff. The DAC is an AKM AK4490 combined with the USB XMOS U8 for bit-perfect support up to 32bit/384kHz. The xDuoo TA-10 even supports DSD256 and once you feed it, the specific LED-Light illuminates from the front panel. 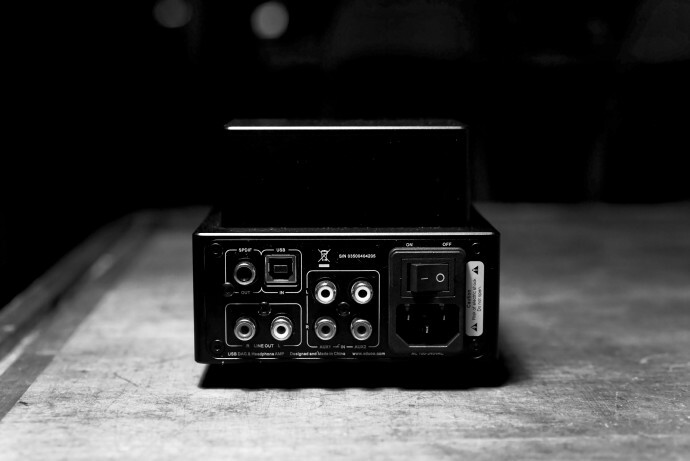 By the way, USB is the only digital input you get, the Cinch/mini-toslink plug is an output to connect another DAC and use the TA-10 as a transport. You can plug your smartphone / computer / DAP thanks to the XMOS chip. It recognized my iPhone almost immediately and with Tidal or Qobuz, you can stream high-definition music straight from your phone. Another nice addition, is the dual clock to support 44.1kHz and 48kHz files without down-sampling. Sound is announced as a blend of both worlds with “vivid vocals”, “natural details” and a strong reserve of power to drive 8-600 ohms headphones. More on that on our incoming review, so stay tuned.